IIHS Top Safety Pick+. This Honda Civic Sedan boasts a Regular Unleaded I-4 2.0 L/122 engine powering this Variable transmission. Window Grid Antenna, Wheels: 16 Aluminum-Alloy, Wheels w/Silver Accents. * This Honda Civic Sedan Features the Following Options *VSA Electronic Stability Control (ESC), Valet Function, Trunk Rear Cargo Access, Trip computer, Transmission: Continuously Variable, Transmission w/Driver Selectable Mode, Tires: P215/55R16 93H AS, Systems Monitor, Strut Front Suspension w/Coil Springs, Steel Spare Wheel. * The Votes are Counted *IIHS Top Safety Pick+, NACTOY 2016 North American Car of the Year, KBB.com Brand Image Awards. 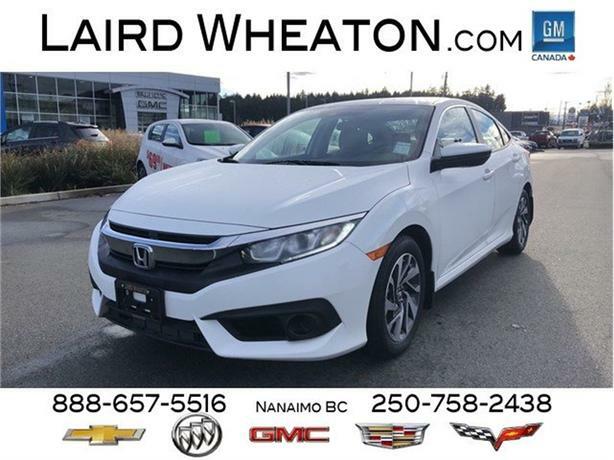 * Visit Us Today *Come in for a quick visit at Laird Wheaton, 2590 Bowen Road, Nanaimo, BC V9T 3L3 to claim your Honda Civic Sedan!